Nevertheless, this diagram is of real scientific importance in two respects. In practice, even under conditions of enlarged reproduction, the greater part of the social product can be looked on as simple reproduction, which forms the broad basis upon which production in every case expands beyond its former limits. In theory, the analysis of simple reproduction also provides the necessary starting point for all scientific exposition of enlarged reproduction. The diagram of simple reproduction of the aggregate social capital therefore inevitably introduces the further problem of the enlarged reproduction of the total capital. We already know the historical peculiarity of enlarged reproduction on a capitalist basis. It must represent itself as accumulation of capital, which is both its specific form and its specific condition. That is to say, social production as a whole – which on a capitalist basis is the production of surplus value – can in every case be expanded only in so far as the social capital that has been previously active is now augmented by surplus value of its own creation. This use of part of the surplus value (and in particular the use of an increasing part of it) for the purpose of production instead of personal consumption by the capitalist class, or else the increase of reserves, is the basis of enlarged reproduction under capitalist conditions of production. The characteristic feature of enlarged reproduction of the aggregate social capital – just as in our previous assumption of simple reproduction – is the reproduction of individual capitals, since production as a whole, whether regarded as simple or as enlarged production, can in fact only occur in the form of innumerable independent movements of reproduction performed by private individual capitals. The volume of enlarged reproduction is independent, within certain limits, of the growth of capital, and can transcend it. The necessary methods for achieving this are: increased exploitation of labour and natural forces, and increased labour productivity (including increased efficiency of the fixed capital). All real accumulation starts with that part of the surplus value which is intended for capitalisation being divided into constant and variable capital. Accumulation as a social process is accompanied by continuous changes in the relation between constant and variable capital, whereby that portion of capital which is invested in inanimate means of production continually increases as compared with that expended on wages. Concomitant with the accumulative process, and as a condition of the latter, there develops an industrial reserve army. These characteristics, derived from the reproductive process as it is performed by the individual capitals, represent an enormous step forward as compared with the analyses of bourgeois economists. Now, however, our problem is to demonstrate the accumulation of the aggregate capital which originates from these movements of individual capitals, and on the basis of the diagram of simple reproduction to establish the precise relations between the aspects of value prevalent in the production of surplus value and the material considerations in the production of consumer and producer goods, with a view to accumulation. This is the first solution which Marx gave to the problem of the accumulation of the aggregate capital. Having dwelt on this aspect of the question already in volume i of Capital, Marx returns to the problem at the end of the second volume of his main work whose concluding 21st chapter is devoted to accumulation and enlarged reproduction of the aggregate capital. Let us examine Marx’s diagrammatic exposition of accumulation more closely. On the model of the diagram of simple reproduction with which we are already familiar, he devised a diagram for enlarged reproduction, the difference appearing most clearly if we compare the two. Department I represents means of production, Department II consumer goods. One glance at the proportion of the figures shows that in this case simple reproduction alone is possible. The means of production made in Department I equal the total of the means of production actually used by the two departments. If these are merely renewed, production can be repeated only on its previous scale. On the other hand, the aggregate product of Department II equals the total of wages and surplus value in both departments. This shows that the consumer goods available permit only the employment of just as many workers as were previously employed, and that the entire surplus value is similarly spent on consumer goods, i.e. the personal consumption of the capitalist class. Here a double disproportion confronts us: 6,000 means of production are created – more than those which are actually used by the society, i.e. 4,000c + 1,500c; leaving a surplus of 500. Similarly, less consumer goods (3,000) are produced than the sum of what is paid out in wages (i.e. 1,000v + 750v, the requirement of the workers), plus the aggregate of surplus value that has been produced (1,000s + 750s). This results in a deficit of 500. Since our premises do not allow us to decrease the number of workers employed the consequence must be that the capitalist class cannot consume the entire surplus value it has pocketed. This proves fully consistent with the two material preconditions of enlarged reproduction on a capitalist basis: part of the appropriated surplus value is not to be consumed but is used for the purposes of production; and more means of production must be produced so as to ensure the use of the capitalised surplus value for the actual expansion of reproduction. In considering the diagram of simple reproduction, we saw that its fundamental social conditions are contained in the following equation: the aggregate of means of production (the product of Department I) must be equivalent to the constant capital of both departments, but the aggregate of consumer goods (the product of Department II) must equal the sum of variable capitals and surplus values of the two departments. As regards enlarged reproduction, we must now infer a precise inverse double ratio. The general precondition of enlarged reproduction is that the product of Department I must be greater in value than the constant capital of both departments taken together, and that of Department II must be so much less than the sum total of both the variable capital and the surplus value in the two departments. This, however, by no means completes the analysis of enlarged reproduction; rather has it led us merely to the threshold of the question. Having deduced the proportions of the diagram, we must now pursue their further activities, the flow of circulation and the continuity of reproduction. Just as simple reproduction may be compared to an unchanging circle, to be repeated time and again, so enlarged reproduction, to quote Sismondi, is comparable to a spiral with ever expanding loops. Let us begin by examining the loops of this spiral. The first general question arising in this connection is how actual accumulation proceeds in the two departments under the conditions now known to us, i.e. how the capitalists may capitalise part of their surplus value, and at the same time acquire the material prerequisites necessary for enlarged reproduction. Department II, in turn, after selling these consumer goods to the value of 100, is now in a position to acquire additional means of production to the same amount from Department I. And in fact, Department I still has precisely one hundred of its surplus product left over which now find their way into Department II, enabling the latter to expand its own reproduction as well. Yet here, too, the additional means of production alone are not much use; to make them operate, additional labour power is needed. Assuming again that the previous composition of capital has been maintained, with a ratio of 2 to 1 as regards constant and variable capital, additional labour to the tune of 50 is required to work the additional 100 means of production. This additional labour, however, needs additional consumer goods to the amount of its wage, which are in fact supplied by Department II itself. This department must therefore produce, in addition to the 100 additional consumer goods for the new workers of Department I and the goods for the consumption of its own workers, a further amount of consumer goods to the tune of 50 as part of its aggregate product. Department II therefore starts on enlarged reproduction at a rate of 1,600c + 800v. Now the aggregate product of Department I (6,000) has been absorbed completely. 5,500 were necessary for renewing the old and used-up means of production in both departments, and the remaining 500 for the expansion of production: 400 in Department I and 100 in Department II. As regards the aggregate product of Department II (3,000), 1,900 have been used for the increased labour force in the two departments, and the 1,100 consumer goods which remain serve the capitalists for their personal consumption, the consumption of their surplus value. 500 are consumed in Department I, and 600 in Department II where, out of a surplus value of 700, only 150 had been capitalised (100 being expended on means of production and 50 on wages). The aggregate product of society has grown from 9,000 to 9,800, the surplus value of Department I from 1,000 to 1,100 and of Department II from 750 to 800. The object of the capitalist expansion of production, the increased production of surplus value, has been gained. At the same time, the material composition of the aggregate social product again shows a surplus of 600 as regards the means of production (6,600) over and above those which are actually needed (4,400 + 1,600), and also a deficit in consumer goods as against the sum total made up by the wages previously paid (1,100v + 800v) and the surplus value that has been created (1,100s + 800s). And thus we again have the material possibility as well as the necessity to use part of the surplus value, not for consumption by the capitalist class, but for a new expansion of production. Thus, after five years of accumulation, the aggregate social product is found to have grown from 9,000 to 14,348, the social aggregate capital from (5,500c + 1750v = 7,250) to (8,784c + 2,782v = 11,566) and the surplus value from (1,000s + 500s = 1,500) to (1,464s + 1,065s = 2,529), whereby the surplus value for personal consumption, being 1,500 at the beginning of accumulation, has grown to 732 + 958=1,690 in the last year. (7) The capitalist class, then, has capitalised more, it has practised greater abstinence, and yet it has been able to live better. Society, in a material respect, has become richer, richer in means of production, richer in consumer goods, and it has equally become richer in the capitalist sense of the term since it produces more surplus value. The social product circulates in toto in society. Partly it serves to enlarge reproduction and partly it serves consumption. The requirements of capitalist accumulation correspond to the material composition of the aggregate social product. What Marx said in volume i of Capital is true: the increased surplus value can be added on to capital because the social surplus product comes into the world from the very first in the material form of means of production, in a form incapable of utilisation except in the productive process. At the same time reproduction expands in strict conformity with the laws of circulation: the mutual supply of the two departments of production with additional means of production and consumer goods proceeds as an exchange of equivalents. It is an exchange of commodities in the course of which the very accumulation of one department is the condition of accumulation in the other and makes this possible. The complicated problem of accumulation is thus converted into a diagrammatic progression of surprising simplicity. We may continue the above chain of equations ad infinitum so long as we observe this simple principle: that a certain increase in the constant capital of Department I always necessitates a certain increase in its variable capital, which predetermines beforehand the extent of the increase in Department II, with which again a corresponding increase in the variable capital must be coordinated. Finally, it depends on the extent of increase in the variable capital in both departments, how much of the total may remain for personal consumption by the capitalist class. The extent of this increase will also show that this amount of consumer goods which remains for private consumption by the capitalist is exactly equivalent to that part of the surplus value which has not been capitalised in either department. There are no limits to the continuation of this diagrammatic development of accumulation in accordance with the few easy rules we have demonstrated. But now it is time to take care lest we should only have achieved these surprisingly smooth results through simply working out certain fool-proof mathematical exercises in addition and subtraction, and we must further inquire whether it is not merely because mathematical equations are easily put on paper that accumulation will continue ad infinitum without any friction. In other words: the time has come to look for the concrete social conditions of accumulation. (1) ‘The premise of simple reproduction, that I(v + s) is equal to IIc, is irreconcilable with capitalist production, although this does not exclude the possibility that a certain year in an industrial cycle of ten or eleven years may not show a smaller total production than the preceding year, so that there would not have been even a simple reproduction, compared to the preceding year. Indeed, considering the natural growth of population per year, simple reproduction could take place only in so far as a correspondingly larger number of unproductive servants would partake of the 1,500 representing the aggregate surplus-product. But accumulation of capital, actual capitalist production, would be impossible under such circumstances’ (Capital, vol.ii, p.608). (3) ‘The specifically capitalist mode of production, the development of the productive power of labour corresponding to it, and the change thence resulting in the organic composition of capital, do not merely keep pace with the advance of accumulation, or with the growth of social wealth. They develop at a much quicker rate because mere accumulation, the absolute increase of the total social capital, is accompanied by the centralisation of the individual capitals of which that total is made up; and because the change in the technological composition of the additional capital goes hand in hand with a similar change in the technological composition of the original capital. With the advance of accumulation, therefore, the proportion of constant to variable capital changes. 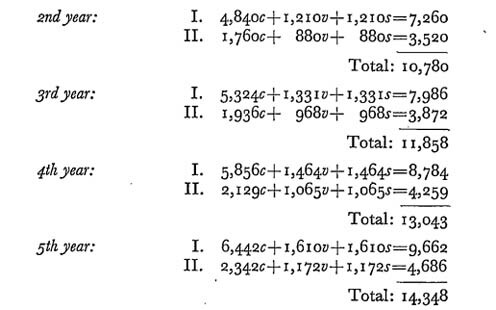 If it was originally say 1:1, it now becomes successively 2:1, 3:1, 4:1, 5:1, 7:1, etc., so that, as the capital increases, instead of its total value, only 1/3, 1/4, 1/5, 1/6, 1/8, etc., is transformed into labour-power, and, on the other hand, 2/3, 3/4, 4/5, 5/6, 7/8 into means of production. Since the demand for labour is determined not by the amount of capital as a whole, but by its variable constituent alone, that demand falls progressively with the increase of the total capital, instead of, as previously assumed, rising in proportion to it. It falls relatively to the magnitude of the total capital, and at an accelerated rate, as this magnitude increases. With the growth of the total capital, its variable constituent or the labour incorporated in it, also does increase, but in a constantly diminishing proportion. The intermediate pauses are shortened, in which accumulation works as simple extension of production, on a given technical basis. It is not merely that an accelerated accumulation of total capital, accelerated in a constantly growing progression, is needed to absorb an additional number of labourers, or even, on account of the constant metamorphosis of old capital, to keep employed those already functioning. In its turn, this increasing accumulation and centralisation becomes a source of new changes in the composition of capital, of a more accelerated diminution of its variable, as compared with its constant constituent’ (Capital, vol.i, pp.642-3). (4) ‘The course characteristic of modern industry, viz., a decennial cycle (interrupted by smaller oscillations), of periods of average activity, production at high pressure, crisis and stagnation, depends on the constant formation, the greater or less absorption, and the re-formation of the industrial reserve army or surplus population. In their turn, the varying phases of the industrial cycle recruit the surplus population, and become one of the most energetic agents of its reproduction’ (ibid., pp.646-7). (7) Op. cit., vol.ii, pp.596-601.